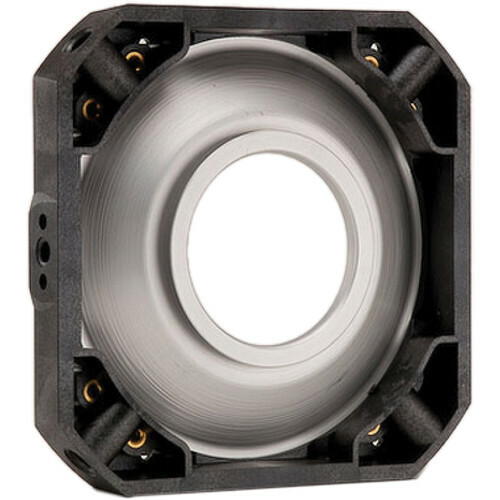 Chimera Speed Ring for Video Pro Bank for Arri Plus 150, Dedolight, LTM Pepper 100, 24W HMI, Mole-Richardson Tiny 200 & Inbetweenie 200 - Circular 3"
For Mole Tiny 200/Inbetweenie 200, Arri Plus 150, LTM Pepper 100/24W HMI, Dedo Dedolight. Box Dimensions (LxWxH) 6.693 x 6.457 x 1.811"
Speed Ring for Video Pro Bank - Circular 3" is rated 5.0 out of 5 by 1. Rated 5 out of 5 by Greg from Real gear requires some expense I use this speed ring on a Dedo light 150, in conjunction with a Chimera soft box extra small 12x16. The ring is very tough, fits the Dedo light perfectly and does just what it is supposed to do - hold the softbox securely to the lamp head. It does this with ease and without any give or stress on the Dedo light. I highly recommend this accessory. will this ring work with Stella Pro 8000? It will work if you have the &quot;Light &amp; Motion Speedring Gel Holder.&quot; That clips into the 3 inch front bezel of the Stella Pro and the Arri speedring slides that.